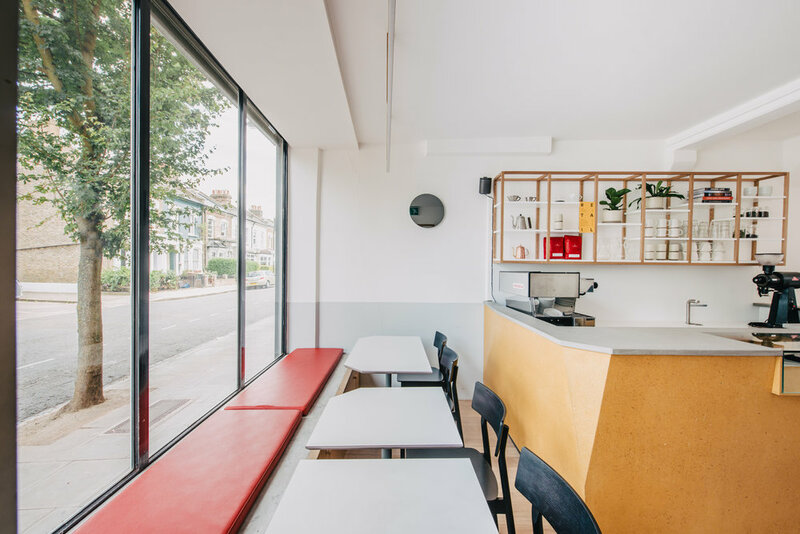 Having seen EJ Ryder's work on restaurants and bars across London, Nia and Jack, owners of our favourite East End café, asked if we might help them with a local refurb. The answer was, of course, yes. So we threw ourselves into a project that spanned from initial discussion to creative brief to fitting, furnishing and finishing. Nia and Jack make and bake the most amazing food here, therefore this project was particularly exciting for us! Designed and built entirely by EJ Ryder, with only one out sourced addition of black Pause chairs for the tables, it was our most immersive project to date. 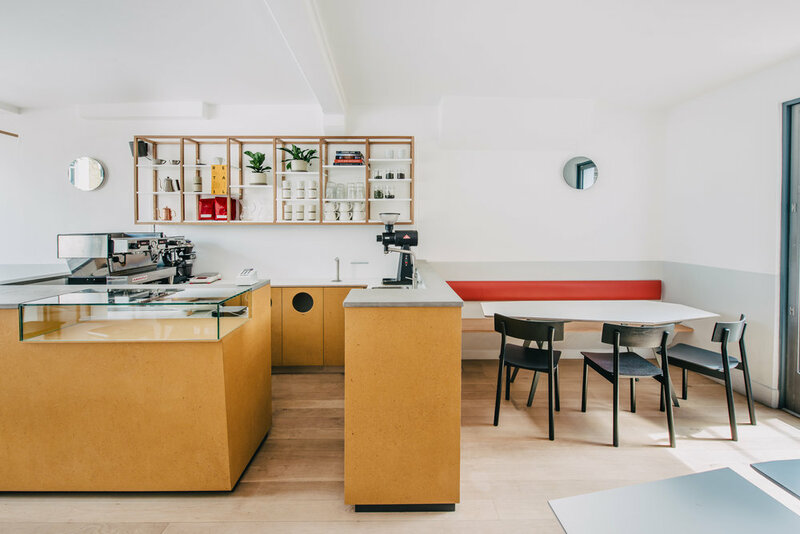 Creating a spacious environment was the highest priority, the cafe has steadily grown in popularity and transforming the limited seating was a necessity. The feeling of space is possibly the biggest success story in this cafe re-fit, their customers can't believe it's the same size as before. The materials used were so varied and each one had it's own story to tell. Viroc (wood fibres and cement) used for the bar came all the way from Portugal - it's vibrant colour is not just down to the material; the lacquer we used was also very important in bringing out the texture and tone. The Microcrete surface for the bar seems to pop up in 1/2 our projects now, it's much lighter than solid concrete and it can be produced in any colour, patination or texture - so versatile it can also be used on floors and for kitchen sinks. We used Fenix laminate on grey engineered wood for the tables which was a very deliberate choice. Other white laminates would have reflected too much light while Fenix has a nano tech structure which reflects almost no light; it's so matte that a computer mouse won't function on it. All lighting here was designed specifically for Esters; notice there are bare bulbs and no pendants. Soft ambient lighting minimises shadows, keeps the lines clean and avoids glare. The 360 Blobi lights made from grey silver mirror glass are a real hit, we'd love to make more of these. They are not a perfect circle, the technical name for this shape is an amorphous blob - why make things circular when any shape is possible?